There's mayhem in the aviary when the spoonbills go to war. A dangerous animal is on the loose, and emergency measures are tested to their limits. Keepers perform an emergency caesarean on Imogen the giraffe. Kaddu the tiger goes under anaesthetic and Ben Fogle learns how dangerous giraffes can be. Ben Fogle and Kate Humble meet three new tigers for the first time. Kate Humble and Ben Fogle prepare a tasty treat to test young tigers' climbing skills. Four keepers travel to Tanzania to help save the lives of some endangered wild dogs. Meet Longleat's latest arrivals - three wild warthogs named after historical figures. Mayhem has broken out in the aviary - the spoonbills are at war. The keepers have arranged a special feast in the honour of the African vultures. Kate prepares a thorny treat for the giraffes and Ben is on the run with the pygmy goats. Babies are imminent on Meerkat Mountain. Kate Humble makes some tortoises feel more at home and Ben Fogle gives an owl an MOT. Ben Fogle and Kate Humble learn to tell a spur-thighed tortoise from a Hermann. The park gets its first new tigers in 18 years. Lord Bath test-drives two new boats. Behind the scenes at Longleat. Elvis the baby Bactrian camel stands up for himself. Kate Humble is the first to be introduced to a pair of new sea lion pups. Kate Humble and Ben Fogle have to distinguish between the park's wildest animals. Kabir, one of Longleat's oldest and most magnificent lions, faces a family feud. The safari park welcomes Gomez, the newly born and beautifully camouflaged tapir. The keepers try to save a newborn pygmy goat that has been rejected by its mother. The vet performs an emergency operation on Lily the pygmy goat. Malaika has been kicked out of the lions' den as her mum has a new litter to care for. Winkie the one-wheeled tortoise needs roadside assistance. The keepers arrange a special feast in honour of the new white-backed African vultures. It's breeding time at the aviary, but not all the birds know how to build nests. With cubs on the way, there are dramatic developments in Wolf Wood. A tiny tapir tot takes his first tentative steps. It is time for Seanna the sea lion pup to attend her first day of training. Baby giraffe Gertie is being obsessively groomed by her mum. The bat cave needs a makeover, but first Darren and his troops must round up the bats. Jess and Jethro have given birth to Gomez - a beautiful baby tapir. While Ben gives tigers Sonar and Kaddu their tea, the lion cubs face a challenge. Safari Park keepers are on a dangerous mission in Kenya with anti-poachers. In Kenya, keepers help inoculate endangered Grevy's zebra against an outbreak of anthrax. 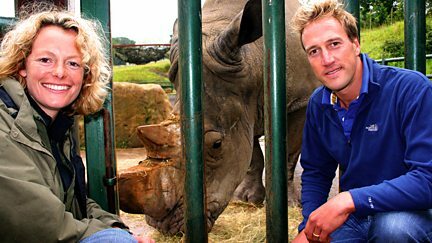 Ben Fogle is on safari using a secret 'bouldercam' camera, learning about rhino dung.